KM Thomas specializes in customized, integrated door security and hardware solutions. Representing a large range of manufacturers in Canada, we can provide you with both mechanical and electrical security hardware and the expertise to integrate them together effectively. For more than 60 years our philosophy has been to provide personalized customer service and high-quality products and solutions. Our team provides expert advice in product selection, along with technical support, system analysis and design. Mechanical Security Door Hardware commonly includes cylindrical locks, mortise locks and exit/panic devices. Find out what to consider when choosing a mechanical locking solution for your application. Electrified Locking Door Hardware is usually selected based on what happens when the power is interrupted. Locks that are powered to lock are called fail-safe (or fail-unlocked), whereas locks powered to unlock are called fail-secure (or fail-locked). This overview highlights the many choices available to you with respect to function and the appearance of electrical door hardware. KM Thomas is proud to offer the Arte Viva line of child safety products to protect fingers, hands and bodies from the dangers presented by doors, windows, tables and floors. Arte Viva is a Dutch company whose goal is to make safe kindergartens and schools the norm around the world. They found that children often get their fingers or hands stuck in between the door and its frame causing serious injury and trauma. Another common accident where children hurt themselves is running into sharp corners or edges. Learn more about Arte Viva door finger guards, door stops, corner guards, window safety locks, non-slip stickers and kids coat hooks. Latch Retraction Kits are a simple solution for electrically unlocking exit devices. This feature provides an overview of how they work, and the field installed kits we have available for different exit device brands. Key cabinets and ID systems are ideal for organizations that rely on keyed locks. This feature outlines the range of solutions we offer to keep your keys secure, from standard Lund Key Cabinets to electronic key cabinets for high security applications and key tagging to simplify management and control. The Thomas Secure School System combines the physical security of durable mechanical door hardware with the latest in access control security technology to create a safe and secure school environment. Read more about all of the unique features and how we can assist in creating the right system for your school. The Thomas barrier-free washroom system with electronic locking is designed to put locking control into the hands of individuals using the washroom. Find out how the system works and how we can help you configure a barrier-free washroom to meet your needs and local building codes. Please visit our product site to view our extensive line of door, access control and security hardware solutions and Request a Quote online. To access our dealer login page, click here. 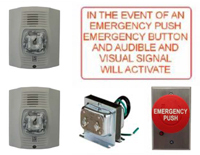 The TA-3230C-KIT meets code requirements for emergency call systems that allow a person inside a washroom to alert those outside that help is needed. The Bommer double acting steel spring hinge is a great option for multi directional swinging doors. This light office gray Lund key cabinet, complete with piano type hinges, is a great option for keeping up to 30 keys organized and catalogued. KM Thomas offers a large line of security and door hardware products and integrated systems solutions. We are the experts in recommending the best products or complete systems to secure your premises. Our in-house team offers technical support, system analysis and design.